Until now, owning an entry-level German luxury SUV was limited to three options -- the Mercedes-Benz GLA, the BMW X1 and the Audi Q3. What's changed? Well, Volkswagen has brought us one of its bestselling SUVs worldwide, the Tiguan. Our guess is that VW hopes the Tiguan will turn its fortunes around in a market which is mostly dominated by just a few players. 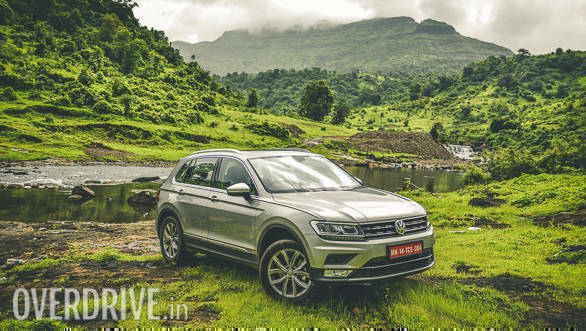 But what's more important here is if the Tiguan, with its comparatively humble VW badge, has what it takes to appeal to the customers looking to make their step into the entry-level German luxury SUV segment. Let's find out! When it comes to the design, I've heard mixed opinions. Some say it doesn't look striking enough to feel like you're in a big expensive German SUV, and I noticed this while driving around in Mumbai. It hardly caught any attention in the hustle and bustle of the city thanks to its understated looks. But take it away from all that and I find that it looks quite fetching. 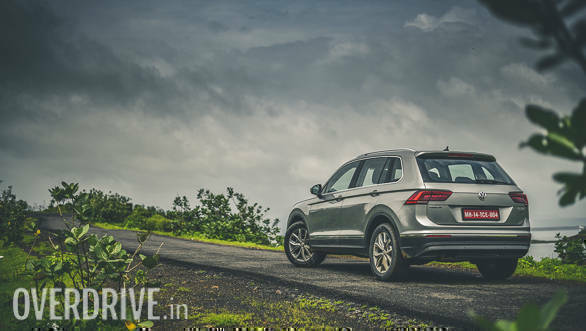 Chiselled is the word I'd use to describe how the Tiguan looks from the outside. Simple straight lines run all around the body that make it look muscular but not bulky. Even the eight-spoke 18-inch wheels are sculpted and go very well with the overall theme. 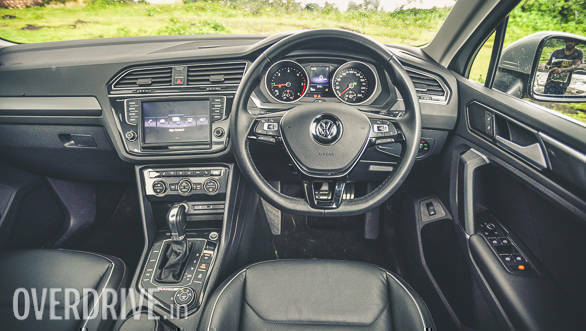 Up front, you have the large LED headlights which neatly integrate into the grille, while all the lines, right from those on the bonnet to the ones on the bumper, bring your attention to the VW badge at the centre. Move to the side, and you'll find that the strong character line running horizontally across the shoulder is the most defining element here. This line flows to the rear and forms a neat fold just about the boomerang-shaped tail lights. Again, the VW badge seems to be the centre of attention here with all the lines and creases leading your eyes right to it. 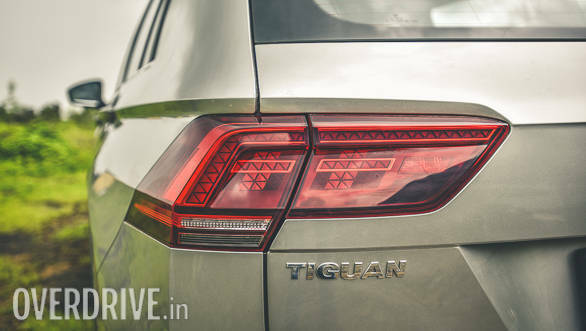 What also catches you attention here are the tail lights with their zig-zag LED detailing. The interior of the Tiguan, like the rest of the car, is not at all flashy. Even though the entire cabin is finished in black, it still feels quite roomy thanks to the large windows. Fit and finish, as you would expect of an expensive German car, are top-notch, and the plastic trims, which neatly integrate into the interesting shapes all around the cabin, keep it looking far from boring. The layout is quite ergonomic too with all the controls spread out sufficiently and within arm's reach. For a car that doesn't look very large from the outside, there's surprisingly a lot of space inside. I'm 6 feet tall and with the driver's seat adjusted accordingly, there's still plenty of kneeroom for rear passengers, who also get a foldout tray. Headroom is very good too and while there's more than enough shoulder room to seat three at the back, the high transmission tunnel could be a problem for the person sitting in the middle. The rear seats can be reclined and slid back, but that's mostly to increase boot space which, at its least, stands at an impressive 615 litres. I do wish the bottom half of the rear seat was inclined upwards for better under thigh support. The front seats, on the other hand, are pretty comfortable, except maybe, it could have done with a little more under thigh support too. 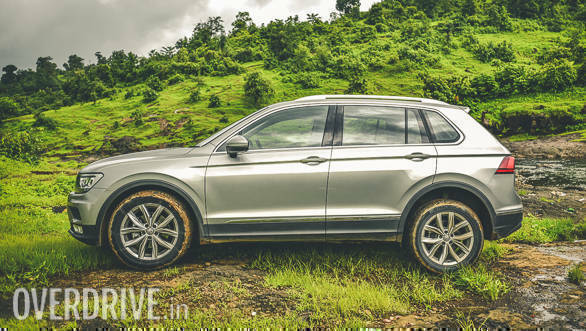 In India, the Volkswagen Tiguan is offered with just one engine -- a 2.0-litre turbo diesel -- and no, it's not from the infamous EA 189 series. It makes 143PS and 340Nm which, on paper, sounds quite low for a car in this segment. However, on the road, it feels more than sufficient. There's just a little bit of lag at the lower end of the range which you'll never really notice unless you purposely short shift. But from around 1,800rpm there's a strong pull almost all the way up to the 4,500rpm redline. Max torque comes in from 1,750rpm and stays till 2,750rpm while max power comes in at 4,000rpm. Power delivery is very linear, but still feels just about aggressive enough to keep the drive interesting. Admittedly, the engine isn't the quietest diesel unit out there, with a fair amount of noise creeping into the cabin. But it is super smooth, free-revving and is very responsive to throttle inputs. 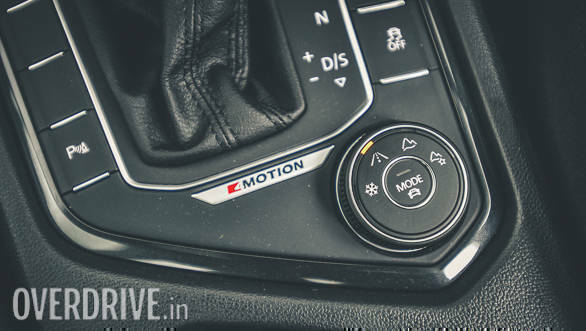 And that's great because it goes hand in hand with the super smooth 7-speed DSG unit. I've always been a big fan of VW's dual-clutch transmissions and this one meets the mark. It doesn't downshift as aggressively as you'd expect, but the best way to drive this car is to ride that surge of torque from the 2,000rpm mark even at higher gears. But if you still insist you want that downshift, there's always the paddle shifters. 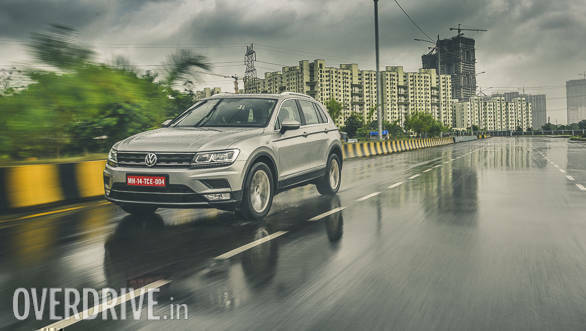 The Tiguan is primarily a front-wheel-drive car, but the 4Motion all-wheel-drive system is constantly monitoring loads and sending power to the rear wheels whenever necessary. As standard, the Tiguan gets four modes to suit the type of terrain you're on -- Normal for tarmac, Snow, Off-road and Off-road Individual. These control throttle and steering sensitivity, the 4x4 system and transmission settings. There are four other modes for when you're on tarmac -- Normal, Eco, Sport and Individual -- which alter steering sensitivity, engine mapping and shift points. In Sport mode, 0-100kmph comes up in 9.6 seconds, which is quite good. To put things into perspective, the FWD Hyundai Tucson, with a 185PS/400Nm 2.0-litre turbo diesel, does 0-100kmph in 9.3 seconds. That's how much of a difference an all-wheel-drive system makes! 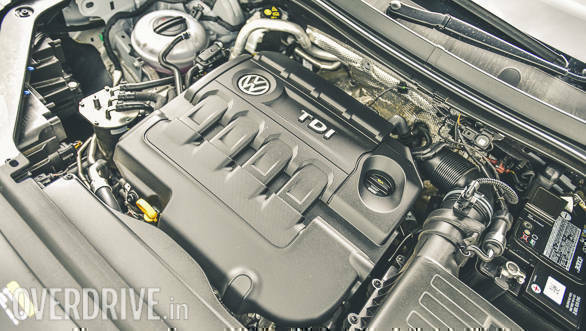 The Tiguan is quite efficient too and in Eco mode, it returned 13.44kmpl in the city and 18.15kmpl on the highway. This, thanks a costing function which drops revs to idle when you take your foot off the accelerator by disconnecting the gearbox from the engine. However, as soon as you step on the brake pedal, it gets back in gear to provide engine braking. Quite clever! The Volkswagen Tiguan features a MacPherson strut suspension set-up at the front and a multi-link system at the rear. It's a very well-judged set-up for people who'll mostly use the car to drive around town or drive across the countries on relatively smooth highways. It rides a lot like a sedan, except your driving position is comparatively higher up. You have to slow down over ruts and potholes or the suspension will protest loudly with thuds that sound quite unnerving. It does feel a bit firm, like a sedan would, but not uncomfortable. Thanks to the relatively large 235/55 R18 tyres, the smaller ruts, which most sedans wouldn't be able to handle, are happily absorbed well. This slightly firm suspension set-up translates to some impressive handling and high-speed stability though. There is just a little bit of body roll which you'd expected from an SUV in this segment, but it's well controlled and hardly anything to worry about. There's plenty of grip too from the Hankook Ventus S1 evo2 SUV tyres, and also from the AWD system. 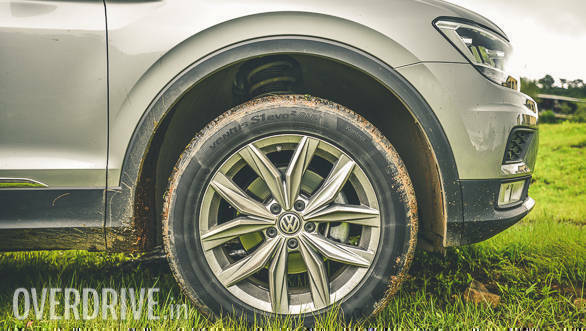 They give you the confidence to push the Tiguan around corners at very impressive speeds. The steering is very responsive too and makes the car super nimble around the city and during quick lane changes on the highway. That said, it doesn't offer an impressive amount of feedback and I thought that the weighting isn't sufficient at high speeds, making it feel quite twitchy. But let's make it clear here that the Tiguan is not a thoroughbred SUV. It's a soft roader, which is fancy talk for a crossover with pretty good ground clearance -- 149mm in this case. It will handle some basic dirt roads without any problems but nothing more. It just doesn't feel as rugged or as indestructible as a full-size SUV like the Toyota Fortuner. But I'm not going to hold that against it because that's not what it's pretending to be. When it comes to safety, the Volkswagen Tiguan, as you'd expect, is pretty well equipped. As standard, you get six airbags, ABS, ESC, disc brakes all around, a driver alert system, hill descent control, ISOFIX seat mounts and three-point seat belts for all passengers. There's also a tyre pressure monitoring system and a reactive hood which opens from its hinges in case of a collision with a pedestrian, to reduce head injuries. But only the Highline trim gets self-sealing tyres which have a gel inside them that seals small punctures and cuts. Also exclusive to the Highline trim are LED headlights and tail lights, a panoramic sunroof, illuminated scuff plates and LED detailing on the interior, keyless entry and ignition, an electric tailgate, and 18-inch wheels (the Comfortline gets 215/65 section tyres with 17-inch wheels). But that's not to say that the lower variant is poorly specced. 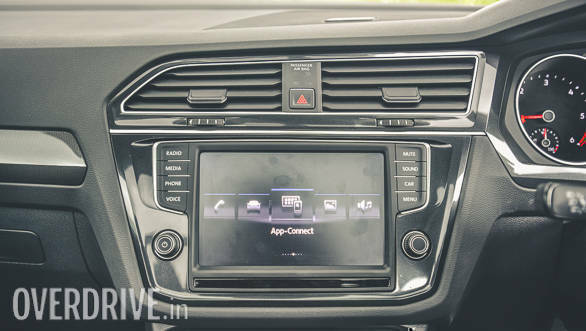 You still get features like three-zone climate control, heated front seats (I wish they were ventilated instead), an auto-dimming IRVM, auto headlamps and wipers, cruise control and a touchscreen infotainment system which supports Apple CarPlay and Android Auto. 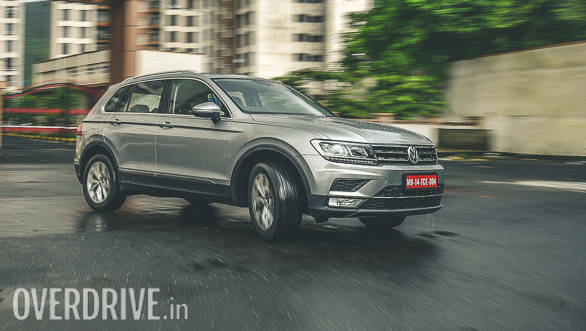 At Rs 29.83 lakh (ex-showroom), the Tiguan's Highline variant is a bit expensive. 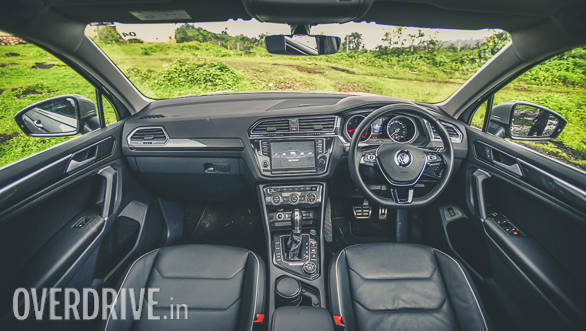 But when you compare it to another entry-level German luxury SUV like the top-spec Mercedes-Benz GLA 200d, which costs Rs 33.85 lakh, it puts things into perspective. 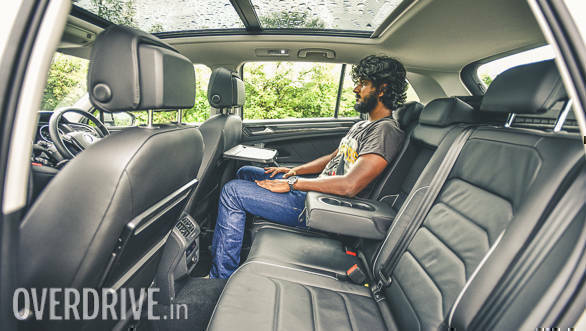 There's also the Comfortline priced at Rs 26.56 lakh, which to me, makes for a more sensible buy if you don't care too much about the frills you're losing out on. 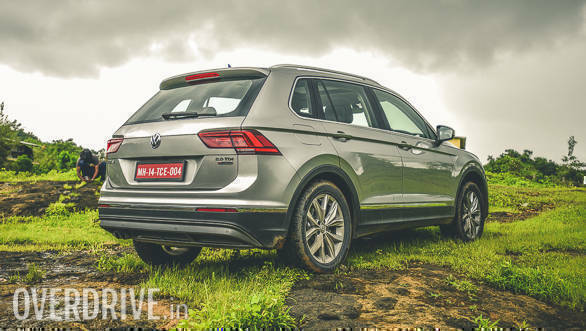 But let's get back to the question of whether or not the Volkswagen Tiguan can be the new gateway into the entry-level German luxury SUV segment. Well, I like the Tiguan. It looks and feels pretty good, offers a good balance between performance and efficiency, handles well, and boasts of an impressive feature list. It's certainly not a proper SUV, but it's not pretending to be one either. It's a luxurious German crossover for people who don't want to draw too much attention to themselves on the road. So if you're the kind of person who isn't interested in the badge a car is wearing, then I think yes!